Manila, Aug 06: Hundreds of Filipino mothers participated in a government-backed mass-breastfeeding event, publicly nursing their children in an effort to combat child deaths, AFP reports. 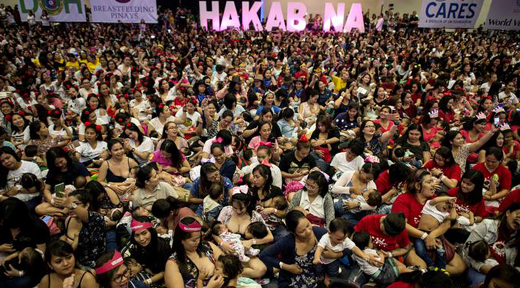 The annual event drew more than 1,500 women to a Manila stadium where the moms breastfed their children in support of a public campaign to get more women to feed their babies breast milk over formula. The World Health Organization and the U.N. Children’s Fund recommend that babies be breastfed within the first hour of birth through their first six months. But according to two reports from U.N. agencies this year, three in five babies globally are not breastfed early, which puts them at a higher risk of disease and death, AFP reports. Out of every 1,000 children, twenty-seven died before the age of five in the Philippines in 2016, according to WHO data. According to the event organizer Rose Padua, 61 other events took place over the weekend, putting the Philippines on track to eclipse last year’s attendance of 4,775 nursing mothers in 25 events.